The Gideon New Testament was the most valuable thing I ever received at school, I became a christian through reading it some years later. 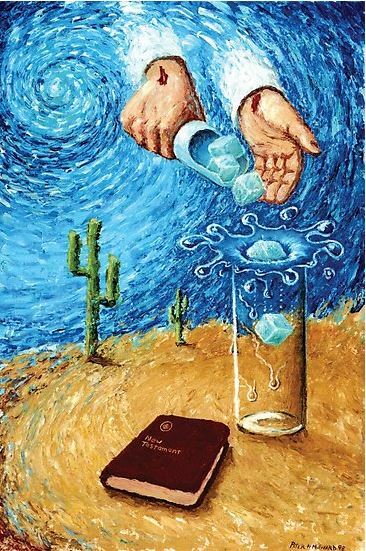 The Word of God is like cool water to a man dying of thirst, and my thirst was quenched just as Jesus promised it would be - so it is a great pleasure to paint this picture. The actual New Testament was lost when painting on a beach in Spain in 1992 when an unusually strong wave came sweeping up the beach past the tide mark and swamped my paintbox! the New Testament was swept away in the surf. It would be interesting to find out where it is now, and who the Lord had in mind to find it perhaps they even found salvation! since then I managed to obtain a replacement which is identical to the one I received at school.